...behind the shed this morning, a large-ish orb weaver spider. X-T2, 65-shot hand-held auto focus stack, put together with Zerene Stacker. Great shot! That thing looks particularly malevolent though. How do you manage the hand held stacks? Does your x-t2 auto stack - unfortunately one of the few features that didn't make it to the X-e3. Set it on continuous high and blast away? unfortunately ( or fortunately if my wife spots it first) we don't seem to get many that big around our place. 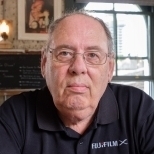 Fuji have the focus shift thing set with the BKT mark under the shutter speed dial, and then in the menu of the X-T2 under "Drive Setting" -> BKT setting-> , which needs two further settings, firstly "BKT Select" -> "Focus BKT", then back off to the "BKT Setting" -> again, and to the bottom of the next list "Focus BKT" ->, which then gives you a choice of how many Frames (up to 999), the Focus Step (1-10) (i.e. the distance increase between shots) and "Interval (1-10 sec) between shots, presumably when tripod mounted for reduction in vibration as well as giving the buffer enough time to clear during the sequence. I shot this at 1/100sec, f/4, 1000 ISO, with my left elbow braced against the shed wall to help keep the framing reasonably steady and chose 65 shots after a couple of practice tries to see what was needed. I set Focus Step at 9, and Interval at 0. You just have to press the shutter button the once, and the camera starts the sequence firing extremely quickly at the 0 Interval setting until it hits the buffer, which, even with my Lexar UHS II 300 mb/s card happens around 50 frames, although that clears pretty quickly and a few shots later the camera picks up speed again. The stacking itself I do with Zerene Stacker, the camera has no facility to do that part of the job, and I haven't investigated Fui's own software to see if that can do the stacking - I'm used to Zerene and the way it works so I'm sticking with that. As the focus shift thing arrived about half way through the X-T2 model life via a firmware update, later cameras might have a better dedicated menu for the function - at first I found the X-T2's addition confusing, but like everything familiarity comes with repeated use. I have the Fuji X-T2 camera too. I also have newer Panasonic m 4/3 camera. It does the focus bracketing AND the stacking itself internally. While I have Zerene Stacker and have used it a lot, it's just so much easier and quicker to do my focus stacks automatically with my Panasonic camera. Zerene stacker's inbuilt retouching facility allowing selective parts of one image in the stack to be revealed by hand (I use a 9x12 Wacom Intuos which makes that function far easier than using a mouse) where the stacker may have included a less appropriate part of another image makes having an external stacking program worthwhile, although in this case everything worked well enough to not have to use it. I also prefer to set my own raw processing parameters which an in-camera stacker can't really do, however it's horses for courses, each individual's needs are different. The forum associated with the developer of Zerene stacker is a phenomenal resource. I really like this image, she's such a cute little thing. If I may ask, what did you use for lighting? Nothing other than available light. The spider spun its web between a shed wall and an earth retaining wall on the south side of the shed, so in the Southern Hemisphere that means shade all year around. Thankfully it was an extremely still morning which is rare here at this time of year, it is usually windy during the day. 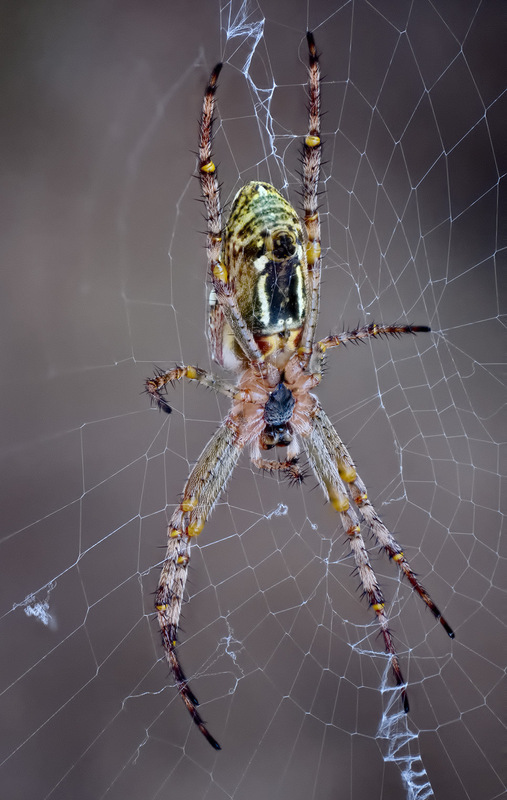 This particular brand of Orb Weaver spider likes to make its web more horizontal than vertical, so the dark background is the earth, and the white wall of the shed probably provided the fill-light to make the web itself highly visible.